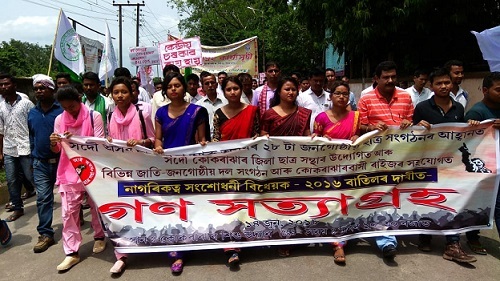 The Kokrajhar District Committee of the All Assam Students’ Union (AASU) along with 28 other organisations on Thursday staged ‘Gana Satyagrah’ in protest against the Citizenship (Amendment) Bill, 2016. A protest rally was also taken out on the occasion. Several organizations like the All Bodo Students’ Union (ABSU), All Rabha Students’ Union (ARSU), Santhali Students’ Union (SSU), All Assam Nath Yogi Students’ Union, Karmachari Parishad, All Assam Goria Moria Jatiya Parishad, All Assam Gorkha Students’ Union, senior citizens, members of the civil society and others participated in the protest with banners, festoons shouting slogans demanding scrapping of the Bill. The protest rally started from the Children’s Park and proceeded through the streets of Kokrajhar. The leaders of the organizations came down heavily on the BJP-led Government at the Centre for trying to dump foreigners belonging to a religious group from the neighbouring country in Assam. “The people of Assam through protests have already made it known to the Government that we are against the Bill. The Bill should be scrapped as it is threat to the culture, language and identity of indigenous people of Assam,” the leaders said. “According to the Assam Accord, 1985, those people who came to the State after March 24, 1971, should be treated as illegal migrants. The Centre should adhere to the clauses of Assam Accord,” said Nabajyoti Roy, assistant general secretary of the central committee of AASU. Leaders from the ABSU, ARSU, Goria Moria Jatiya Parishad also voiced their strong protest against the Bill saying that it would change the demography of Assam and would greatly affect the indigenous community.